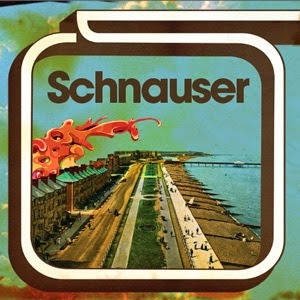 Progressive rock is not something I think would still be explored in 2014, but Schnauser on Fruits De Mer Records is reworking the form on two covers for this single. It's the first release on Fruits from the four piece out of Bristol UK and they must have something to prove choosing a track from Yes, "Astral Traveller" and "As Long As He Lies Perfectly Still" from the Soft Machine. A-Side's Yes cover "Astral Traveller" opens on a phaser wah powered wakka wakka guitar riff that fades into a harsh treble organ and the psych part for me comes from these vocals. This could be early Lilys in it's extreme changes and shifting eq'd vocals back and forth across the channels, pure English psych like the Earlies. Aable to hit the high stuff for those angelic harmonies in bizarre timings coming from all kinds of directions, they give this original a crazy carnival farfia and warped electric, dragging the rock tempo back into this kaleidoscope of melodies like pressing the different voice buttons on a casio as it plays through the demo. An exercise in how many different ways they can arrange this thing, some kind of math-psych can that be a thing? Is that what prof rock is? Crisp and pushing all the bent sounds to their current technical limits. Make no mistake they won't let you think this is from any other time period then today. The Soft Machine cover "As Long As He Lies Perfectly Still" on the B-Side deceptively opens on organic powered acoustics and lower tempo bass. Like early Beck it's got that same kind of heavy historic knowledge and skill while applying it to his wacky interpretation of 'psych' from the outside. A little bit funky jumping from effect to effect, measure to measure, a heavy ride cymbal and massive wah to chorus to phaser, whir the vocal manages amazingly in both of these cases to hold the tracks together in tone. A warm fuzzy distortion extends to the horizon and the vocal washes off into sustain with a complex wah keyboard solo? Too much psych to even sift through really taking every last hint from that history leaving themselves time for huge plateaus even on the length of a single. Thought out and played to a perfect T.
No CD's and no digital downloads from Fruits De Mer Records. Sold out at the source, but check their distro links page here. Samples of a previous album on their Facebook page.